PAUL COOK challenged Pompey to overcome their mental shortcomings as they go to Grimsby. The Blues boss believes his side need to start fearing their opposition if they are to rid themselves of their inconsistency. Allowing themselves not to see rivals as a challenge has led to the bar dropping when it comes to levels of performance, in Cook’s eyes. And he is out to ensure that is eradicated as they go to Blundell Park tomorrow. Cook said: ‘You can’t go from Luton on Tuesday night to Stevenage. You can’t do that to the supporters. You can’t do that to the board and staff. ‘It’s not right. You can’t be so high and drop so low dramatically. There has to be a fundamental problem. ‘If our players aren’t stimulated by the opponent they labour to win the game. ‘They’re the realistic problems. They’re the problems I have to sort as manager. ‘How do I stimulate a brain? Now we’re getting into the heart of the matter. ‘If you fear the opposition you do something about it. ‘When we don’t fear the opposition we’re not the same animal. ‘That’s managing the club. That’s my job to solve those problems. ‘That’s the problem we’re trying to solve when we’re fourth in the league. ‘To play for Portsmouth you have to have a bar of where you’re at. ‘If you drop below that you’ll get beat. We drop below that after big games. It’s there. It’s been a long couple of weeks for Cook and the Pompey squad off the back of the disappointing defeat to Stevenage. That result has lingered over the Blues’ training ground, with it coming off the back of an impressive success at Luton. 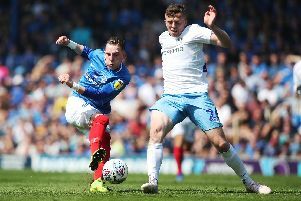 Now Pompey have to shake that off as they make the long trip to Lincolnshire to take on the Mariners. Cook has indicated the same players will get the chance to put the Stevenage loss right. He said: ‘When I came off at Luton I felt in a good place as the manager. ‘That’s what has been the hardest thing about the past two weeks. ‘You don’t go to Luton and do what we did to them, and control the game at Plymouth to then fall on your face. ‘The biggest thing that disappoints me is people think they do it deliberately. ‘For anyone wondering, our team on Saturday will be the same team who lost to Stevenage. That’s our team. I have great belief in the players. ‘We have the ability to not do ourselves justice. ‘Just draw those games. Draw at Notts County at home, draw at Accrington. ‘All of a sudden we’d have three or four more points. All of a sudden we’d be a win off the top three. Check out our Pompey Stats Centre here.